Reading defender has returned south but Dons remain interested in having him back. 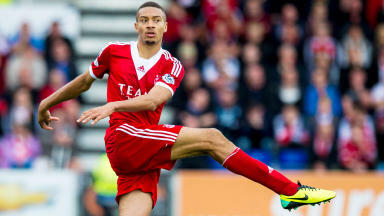 Aberdeen manager Derek McInnes has not given up hope of re-signing defender Michael Hector. The 21-year-old was given a huge ovation from the travelling Aberdeen fans at Rugby Park on Sunday, as he prepares to return to parent club Reading. 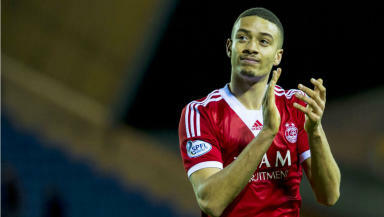 Hector has been a hit at the Dons since arriving on loan from the Royals and McInnes said he will monitor the situation with a view to bringing him back north. McInnes, who had defender Alan Tate, his new loan signing from Swansea, on the bench, said: "Reading are in charge of the situation. "They have got their own issues with defenders, they have a few injuries. "If Reading were better equipped, they see Michael staying here as a good thing. "We will keep in touch with Reading, there are three-and-a-half weeks until the (transfer) window closes." Hector said that he will state he case to boss Nigel Adkins when he arrives back at Reading on Tuesday. Referring to his ovation at the end of the game, he said: "The fans are incredible. Even three-and-a-half hours away, they still bring big numbers. "It's good to be appreciated and it was a nice feeling. "I will go in on Tuesday to see the manager and the director and I will see what happens. I will ask if I can stay. "That's what I have wanted to do from early doors, but it's not down to me. "They have got a few injuries in defence but I think they are getting a few numbers back so hopefully they will be back fit. "The loan spell has been really good for me. 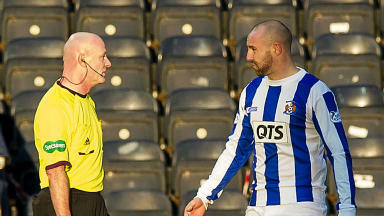 It has shown me that Scottish football is a good standard, it's not built up much down south." McInnes felt his side just about merited their 1-0 win against Killie on chances created and he felt an injury-time red card for substitute Nicky Low for a foul on Sean Clohessy was "really harsh". McInnes added: "He over-ran the ball and in his enthusiasm to make up for it he has just half-slipped - there were players slipping all over the place today. "He lost his footing and kind of lunged but he has pulled out at the death and almost stopped himself."